Textures of Family: Family Court Mural Project, Springfield, Massachusetts, 2016. The Hampden County Courthouse Probate and Family Court in Springfield, Massachusetts invited students from Springfield Conservatory of the Arts (SCotA) to make murals for the courthouse in Spring of 2016. As the magnet resource teacher for integrating arts, I taught students at both the high school and middle school levels as well as coached teachers on integrating arts across the curriculum. I collaborated with SCotA students in the high school painting/drawing course to make this mural. Students are aware that the Family Court can be a space of distress and rupture for families. It can also mark a time of joy and reunification for some families, and protection for families escaping violence. Students aimed to produce murals that would communicate the complexity of the space, and also provide some visual joy to the visitors to family court. In summer of 2016, these murals were installed at The Hampden County Courthouse Probate and Family Court. Textures of Family is a collaborative mural produced by high school students at Springfield Conservatory of the Arts (SCotA) with the hope that you will see a part of your story of family life in the painting and that we may all learn a little bit more about the multiple ways of being a family. Textures of Family by high school students of Springfield Conservatory of the Arts. June 2016. When Registrar Sequin of Hampden County Courthouse Probate and Family Court invited high school students from Springfield Conservatory of the Arts (SCotA) to make a mural for this space, the students discussed the many ways in which family life is shaped. They noticed the wide range of experiences that encompass family life beyond the traditional structure of what was once considered the “nuclear family” of a mom, dad and their biological children. Students chose to depict multiple representations of family life such as: foster care, grandparents raising grandchildren, single moms, single dads, families led by two dads or two moms, transgender parents, families coping with illness, families rooted in multi-generational households, families of adoption, and more. Students also considered many realities of contemporary family life, such as the ways that multi-racial families, and families with varying religious beliefs create caring, inclusive households. To prepare for this mural project, SCotA students investigated how families are represented in current visual culture through advertising and film media. They studied multiple artistic representations of family life through the work of several artists who portray diverse families in photographs, paintings, videos, collages and other art media. The photographs by GiGi Kaeser and interview texts by Peggy Gillespie of Family Diversity Projects, Inc served as an anchor for the classroom dialogue and artistic inquiry. Some of the GiGi Kaeser’s photos served as models for the figures in the final mural. 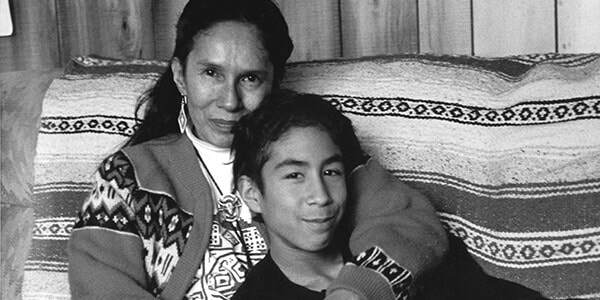 Family Diversity Projects (http://familydiv.org/) is a non-profit organization (501c) located in Amherst, Massachusetts, which exhibits their award-winning photo-text, exhibits worldwide. Illustration by Simón Silva, 2001. “Tar Beach” story quilt by Faith Ringgold, 1996. The artistic practices advanced by contemporary Nigerian-American artist, Njideka Akunyili Crosby through textured collage mixed with painting sparked the students’ imaginations. They chose this method that employs fabric patterns and tactile textures to compose vignettes of figurative representations of diverse family life. Their choices were informed by techniques with long traditions through art history, as well as new perspectives about layering media to convey complexity of meaning. In this way, the work of Njideka Akunyili Crosby http://njidekaakunyili.com/ drove forward the students’ analysis of imagery and experimentation with art media. 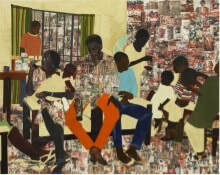 Collage/Painting by Njideka Akunyili Crosby, 2012.